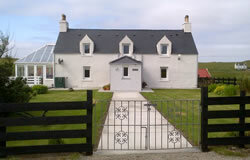 Cnoc nan Uan is situated in an area of natural beauty with sandy, white beaches nearby. Approximately one mile away is the Balranald Nature Reserve where the RSPB have a visitors’ centre. The corncrake can be heard (and sometimes seen) on our croft. Cnoc nan Uan was recently renovated to a high standard. To allow for self catering, the property has been divided into two separate apartments. Entrance to the self catering apartment is through the front porch. Sleeping accommodation consists of two upstairs bedrooms, a double with full en-suite facilities and a twin with adjacent bathroom. The bedrooms are warm, comfortable and relaxing. There is a Freeview TV/DVD and hairdryer in each bedroom. Equipment in the newly fitted downstairs kitchen consists of kettle, toaster, electric oven and hob with cooker hood, microwave, George Foreman grill, cafetiere, washing machine, fridge freezer, Freeview TV/DVD, clothes horse, iron and ironing board. There is a good selection of dishes, cutlery, utensils, glasses, pots and pans etc. We will be happy to provide any other required item upon request. The front porch has a toilet, wash hand basin and shower. Wi fi is available and there is a clothes line for outdoor drying. Self catering guests are welcome to use our conservatory which is ideal for relaxing in at the end of the day. The setting is tranquil, the birdlife is fascinating to watch and some beautiful sunrises and rainbows may be seen. (See our facebook page). There is ample parking available for vehicles. We welcome our guests with tea/coffee and home baking....and we look forward to welcoming YOU! Prices are inclusive of all costs.